Get the most from your Sportster, from street tuning to all out drag racing! The Sportster is examined from 1957-Present, with details of its development and all the important changes through the years. 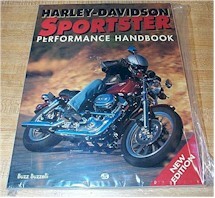 This softbound book by Buzz Buzzelli is a must for Sportster owners. 192 pages and 300 detailed photographs and illustrations.